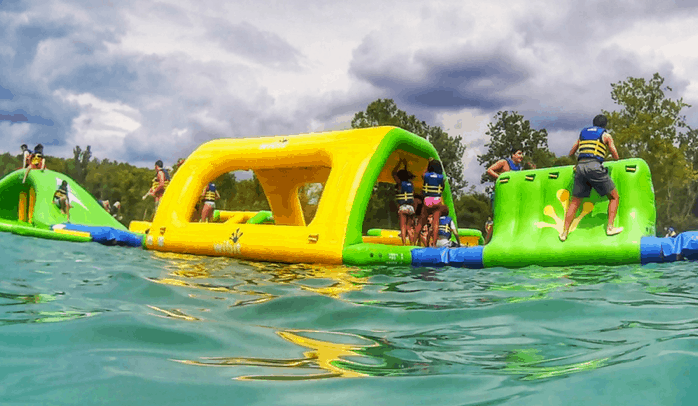 Anytime that I’ve seen online footage of an inflatable obstacle course on the water I’ve had instant FOMO (fear of missing out) and started mapping out how far away the attraction is because it looked so FUN! 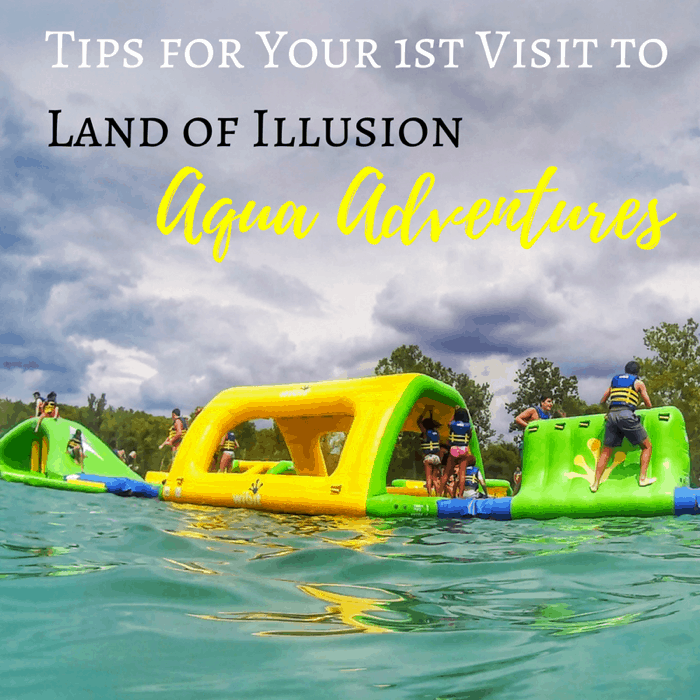 Luckily we didn’t have to travel too far and we were able to bring our boys and some of their friends for an afternoon adventure at Land of Illusion Aqua Adventures in Middletown, Ohio, and it did not disappoint! 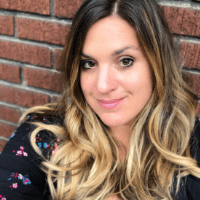 I’m sharing tips and what to expect during your first visit. Upon arrival, you will purchase your ticket or bring the print out of your online ticket and turn in a waiver. 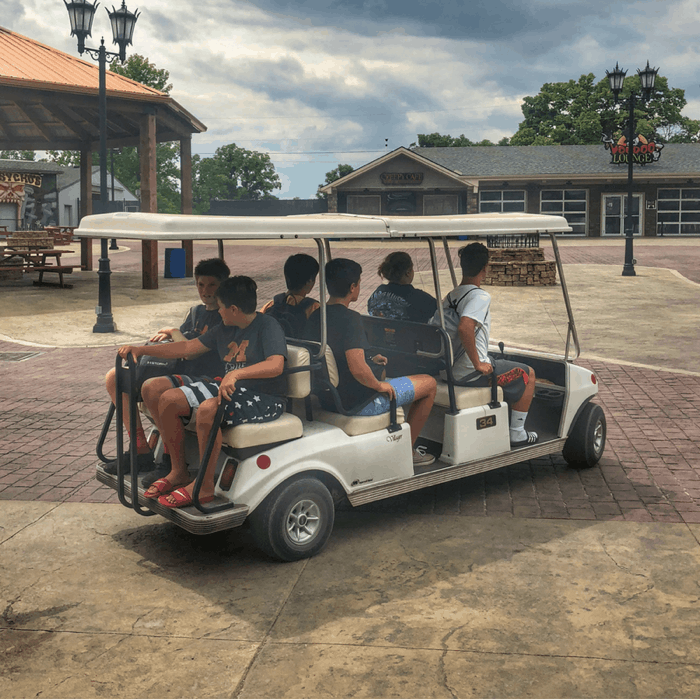 The distance from the main entrance to the aquatic area is definitely walkable but you’ll appreciate the extra level of customer service with complimentary golf cart rides for all guests. Every participant must have a waiver filled out. 17 and under need to have one signed by a parent or guardian. 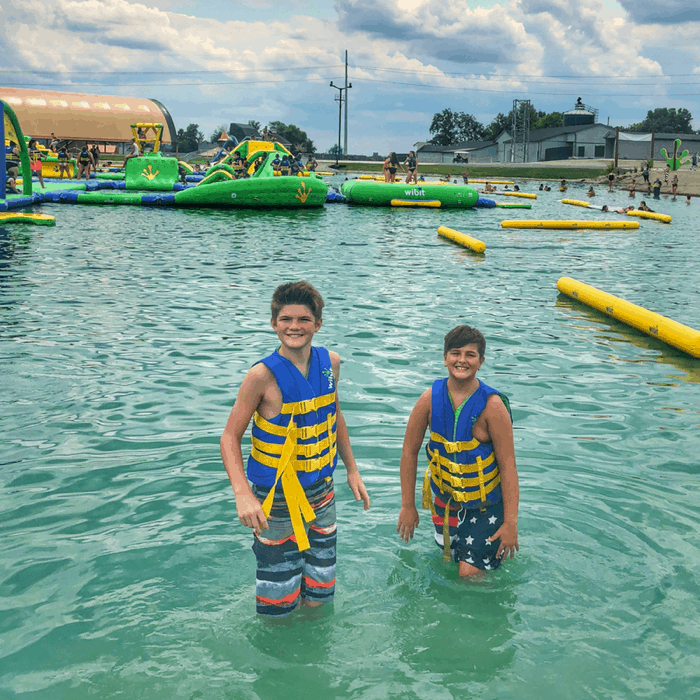 Before you play on the Wibit Adventure Zone, first you have to put on a lifejacket. 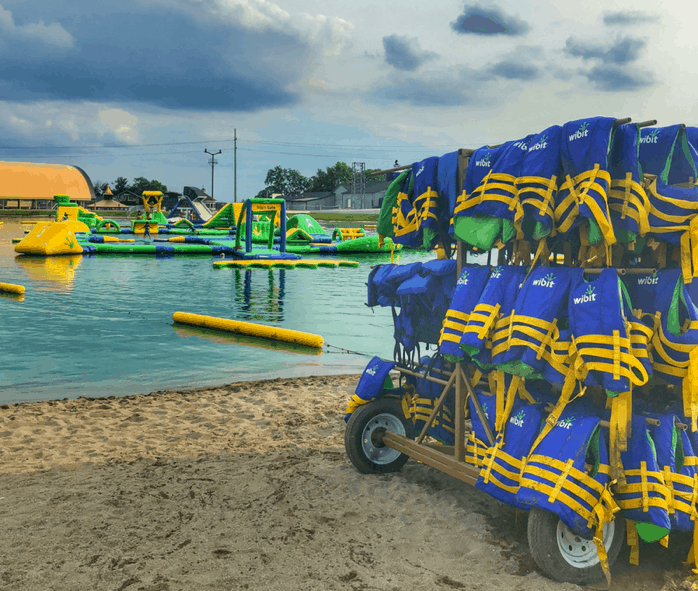 There is an assortment of sizes provided onsite or you can bring your own life jacket. You are also required to wear a life jacket on the paddle boards. 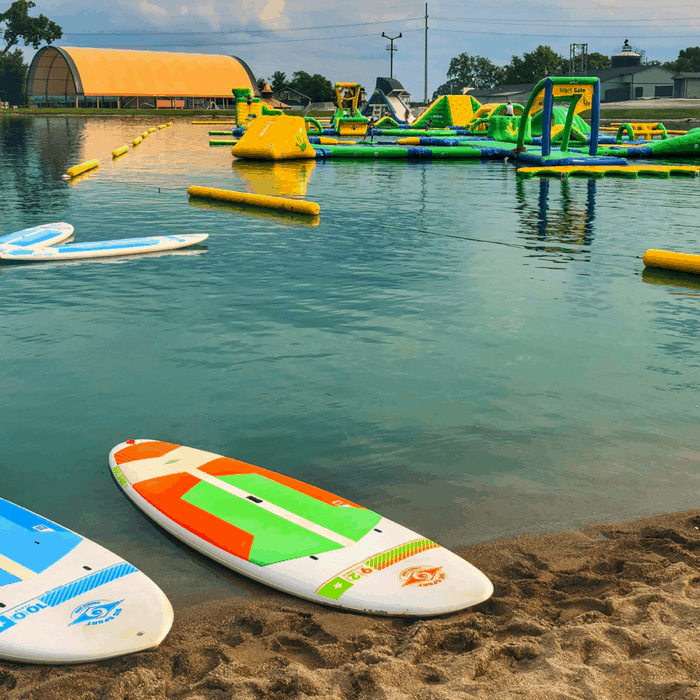 Water socks are allowed but shoes are not allowed on the Wibit or Paddle Board. If you go barefoot in the water it’s a little rocky and slimy in a few parts but you probably will only be in the shallow briefly when you are entering or exiting the water. 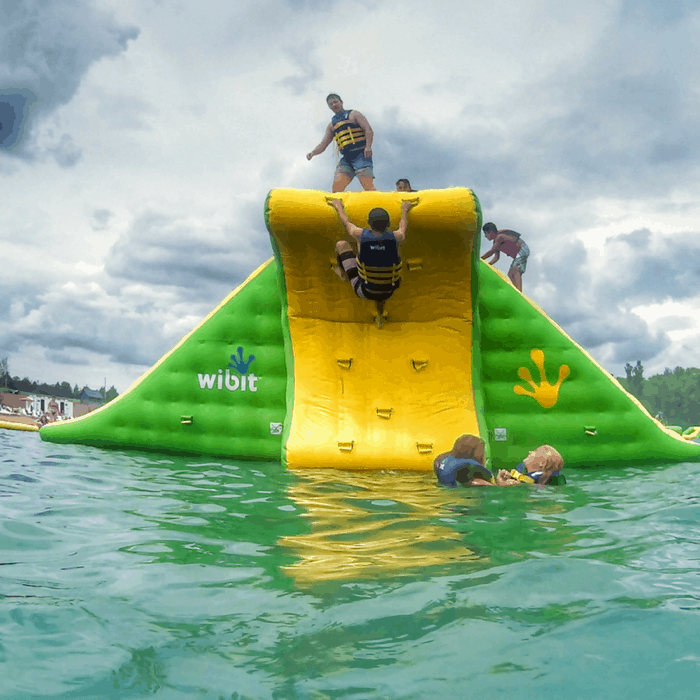 When you fall off the Wibit Obstacle Course, the water is deeper which is why you will be glad that you have a life jacket on after a long day of play. There are lounge chairs along the beach and tables with umbrellas near the bar area. 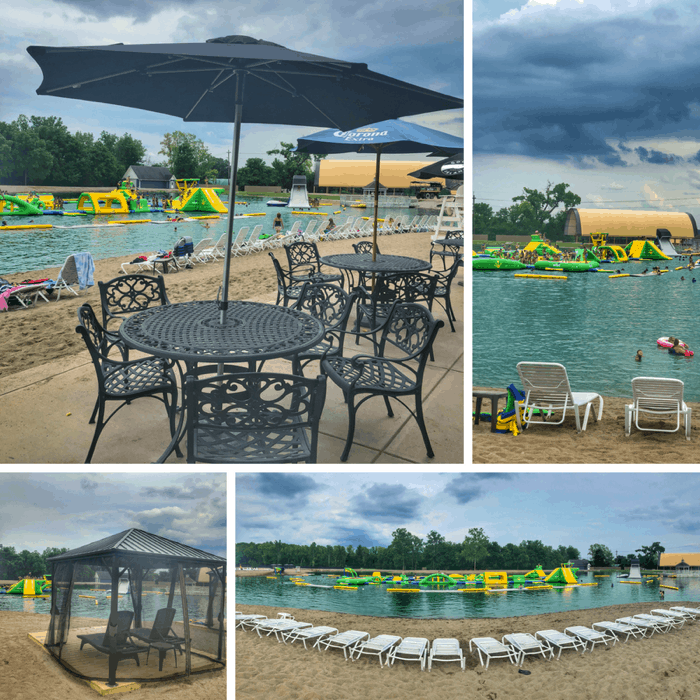 If you are concerned about making sure that you have a guaranteed chair, you can rent a cabana or bring your own folding chair to the designated seating area. Speaking of chairs, you REALLY DON’T need one for each person in your family. 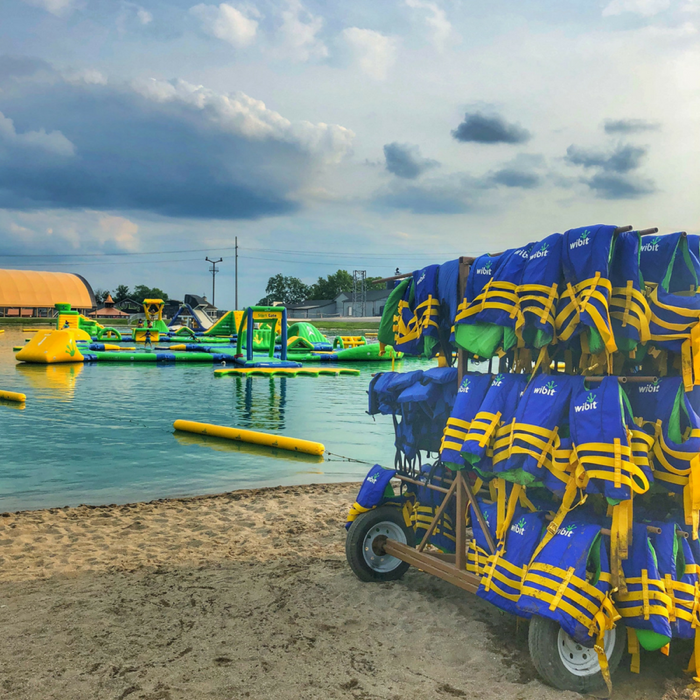 You will be spending most of your time in the water, so be kind to other adults who aren’t swimming and don’t save chairs for kids who will realistically never use them. 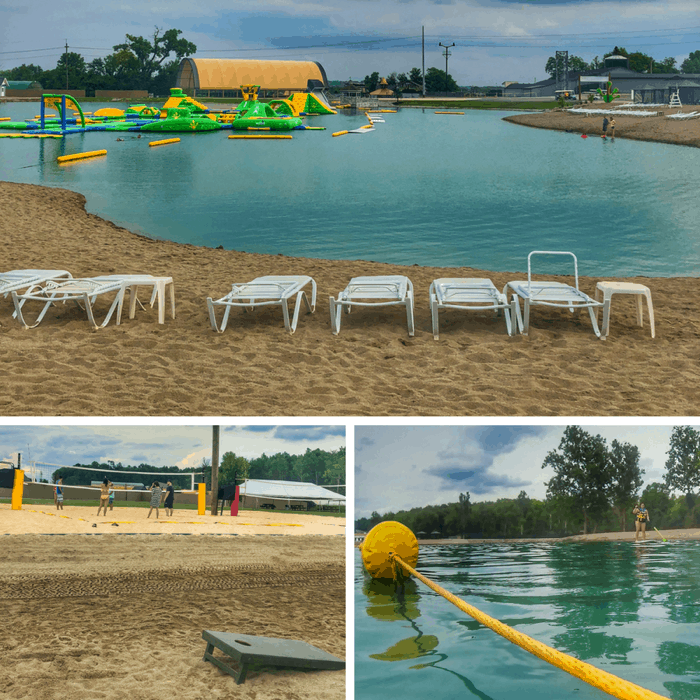 There are 3 sand volleyball courts, corn hole games, a swimming area, and large beach. 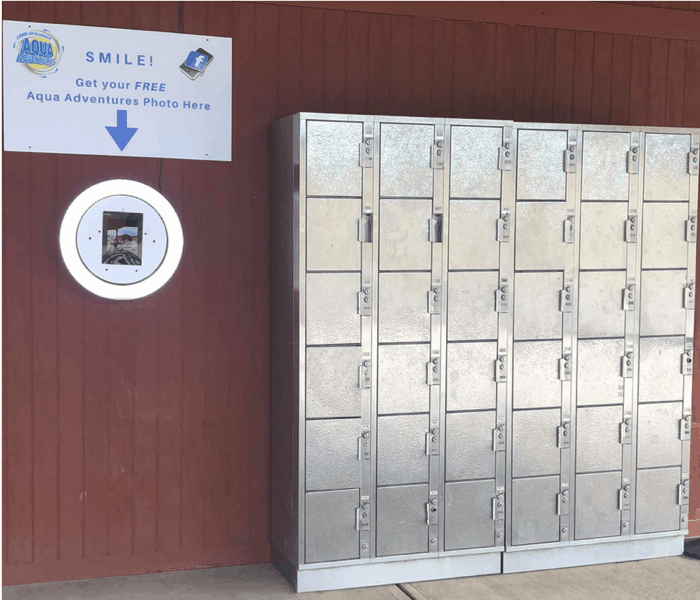 There are lockers available for rent located next to the area where you can take a fun picture for social media. 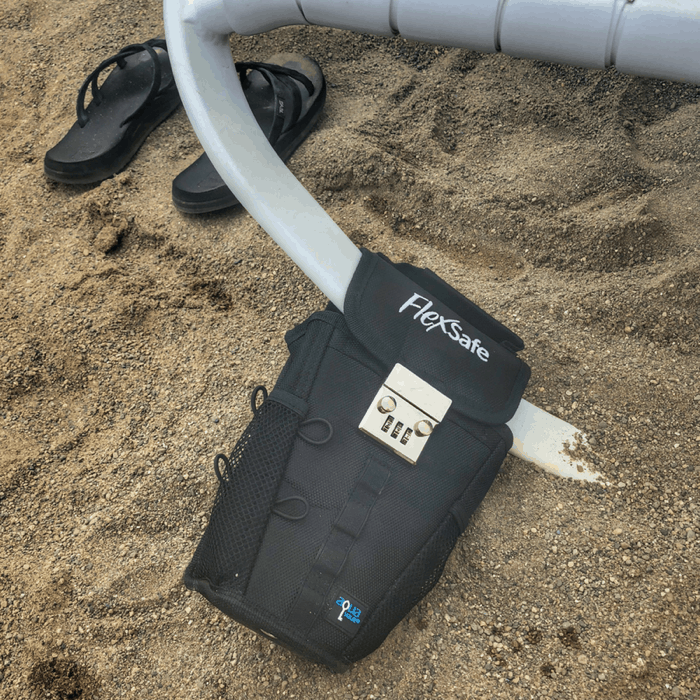 If you like to keep your cell phone handy, you might want to check out one of my favorite items to bring to a waterpark, the FlexSafe by Aqua Vault portable safe, that can attach to a chair. I take a TON of pictures whenever I travel so it’s more realistic for me to use this option for my phone. You cannot bring outside food or beverages into the waterpark. The only exception is for medical supplies or baby formula that can be brought in an 8 x 10 soft sided cooler. 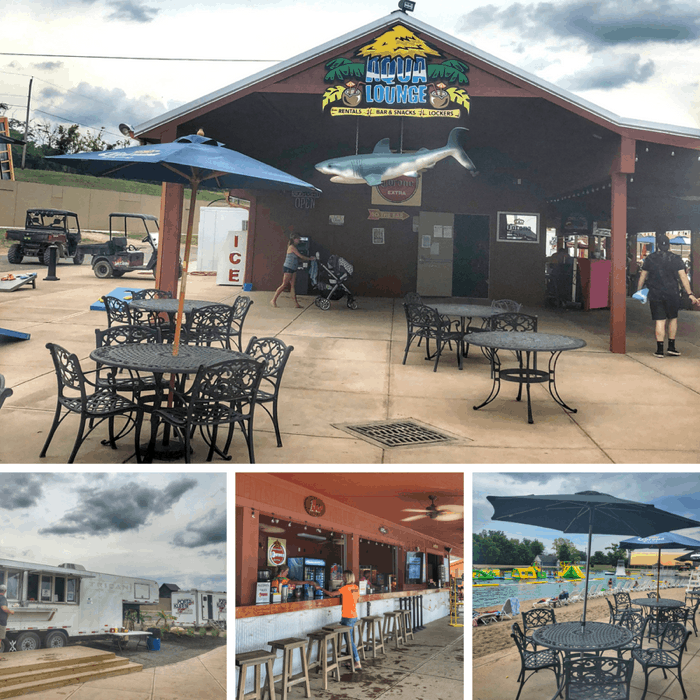 Sandy Cove and the Aqua Lounge area has food and drinks available for purchase including adult beverages. I recommend wearing your swimsuit to the waterpark. There is a restroom toward the main gate entrance. At the waterpark, there is a trailer with Porta- Kleen with separate entrances by gender that you could change in if you need to. Adults, I’m talking to you here! I highly encourage you NOT to sit this one out! 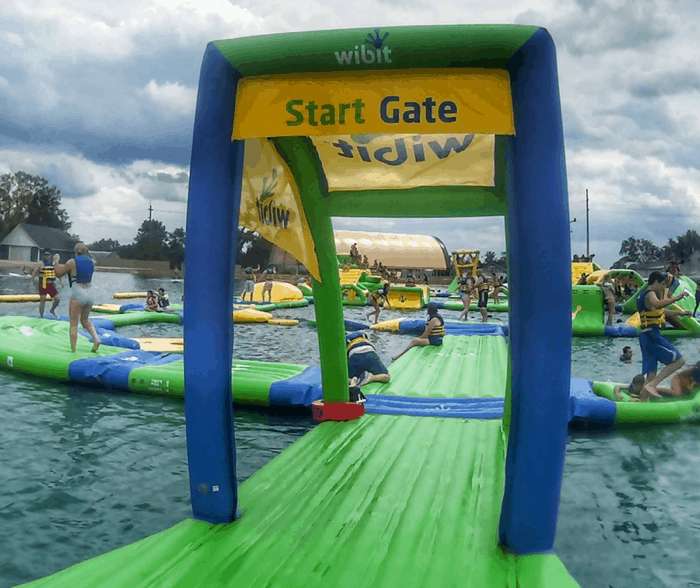 I noticed all sizes and ages (even senior citizens) on the Wibit Adventure Zone water obstacle course and everyone was having a BLAST! 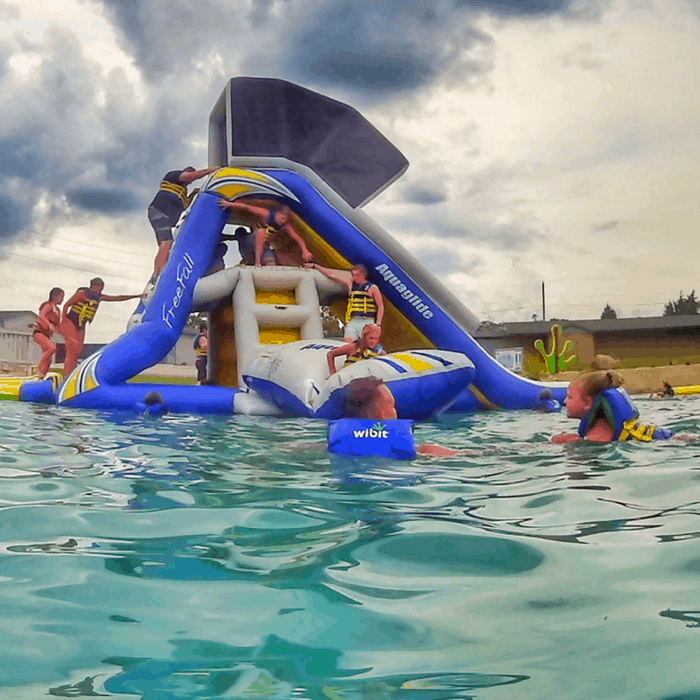 If your kids watch you attempt a challenging obstacle or even better, witness you during a crazy wipeout, you will earn extra respect…even if they won’t tell you that. The obstacle challenges are a good mix and range from fairly easy to difficult….especially when wet. You will put your balancing skills and your strength to the test in a good way with lots of laughs guaranteed. I had a few challenges that took several attempts but it felt great when I finally did reach my goal. 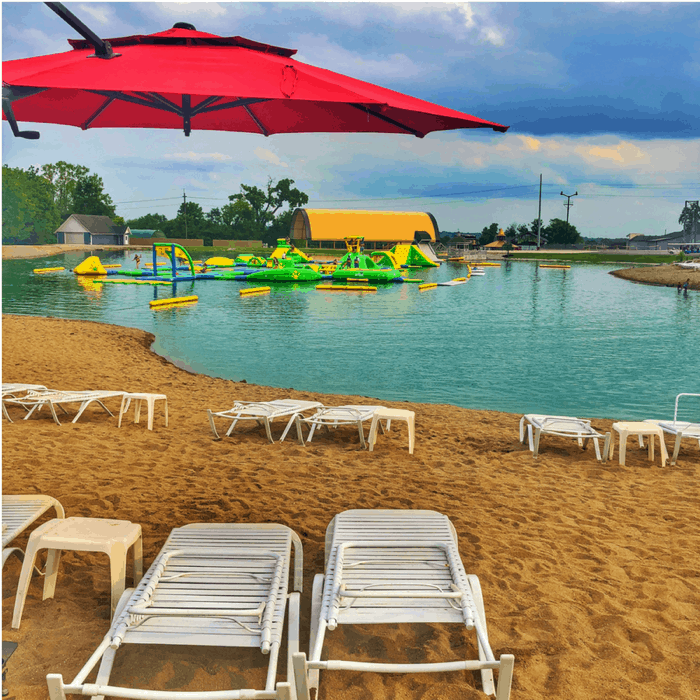 Younger guests can enjoy playing in the sand by the beach or swimming along the beach. 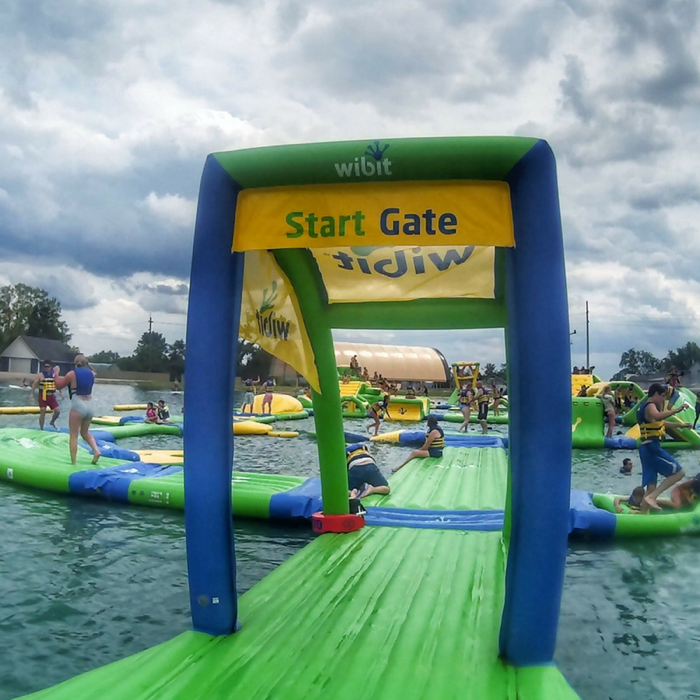 You need to be 43″ for the Wibit Obstacle Course and Paddle Boards. This is the type of adventure that is perfect for families who have a range of ages because there is something for everyone to do….and still enough space for your teenagers. It’s also REALLY fun for adults without kids too! 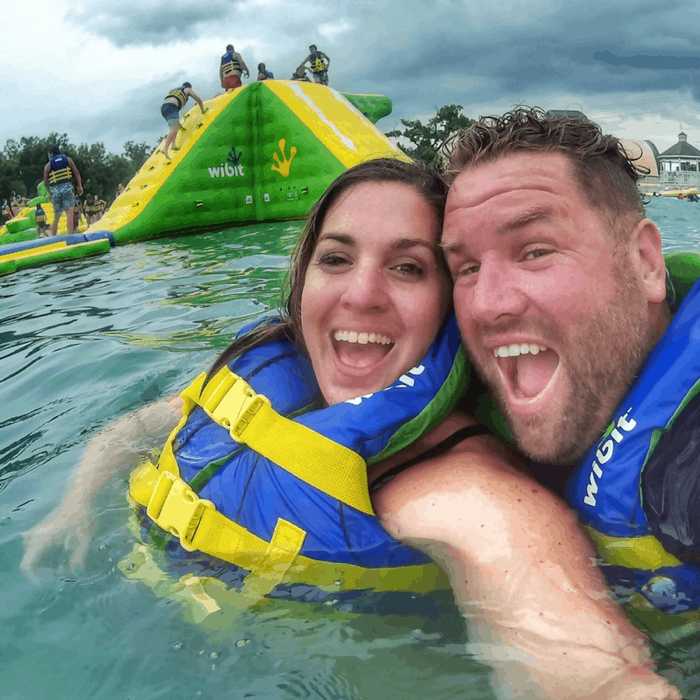 We stayed in the water almost as long as the kids. 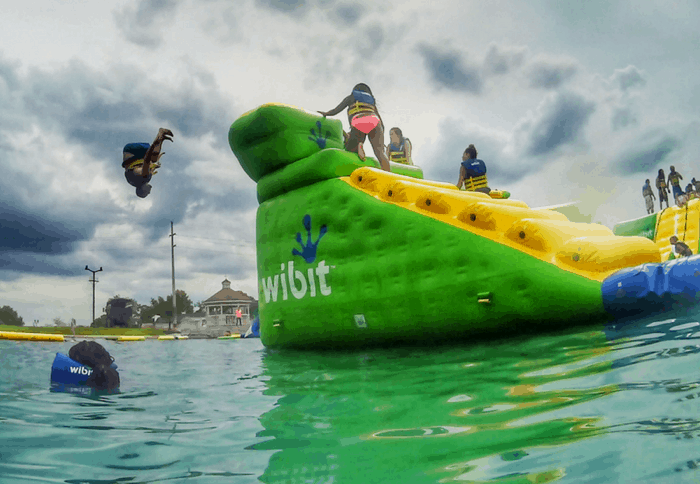 If you want a few extra laughs, hang out near the area with the mini blob where one person sends another into the air….if they land on the inflatable pillow just right…but it’s still pretty funny if they land just wrong too. **I highly recommend that you wear a swimsuit that you would feel comfortable climbing, slipping and sliding around in. The more coverage the better to help avoid swimsuit malfunctions in anticipation of some potential awkward wipeouts. 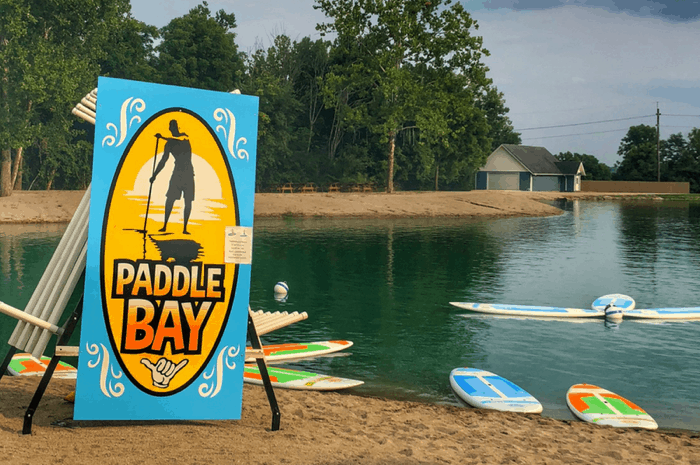 If you want to try a more laid back experience on the water, you can rent a stand-up paddleboard for 30 or 60 minutes. I would recommend starting with 30 minutes because the time passed pretty slowly. If there is more than one person in your group who wants to try it, you might want to go with the hour. 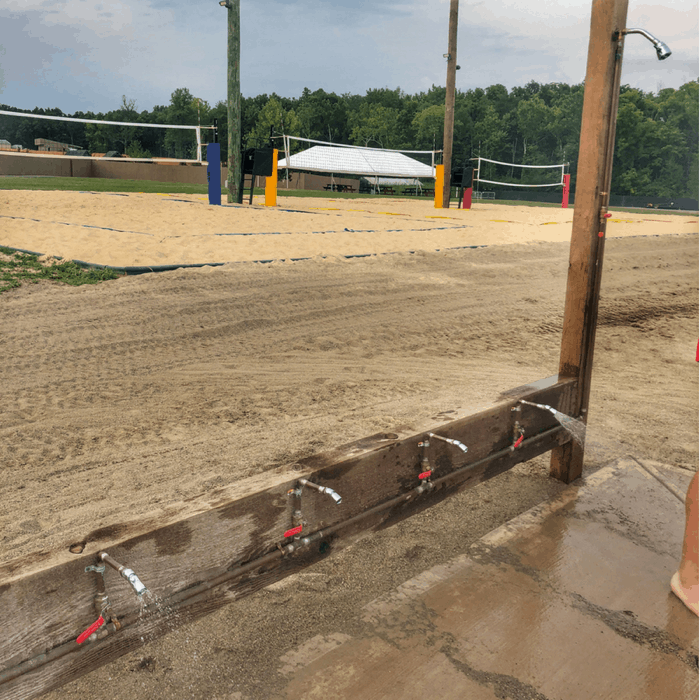 After you are done swimming, you can remove your excess sand at the outdoor shower instead of bringing it to your car. For the best pricing purchase your tickets online and print your ticket and waiver before you arrive. Midweek visits have a reduced rate. *Accurate at the time of posting but always check their website for the most up to date information. *Group tickets are only sold online for parties of 15 or more. 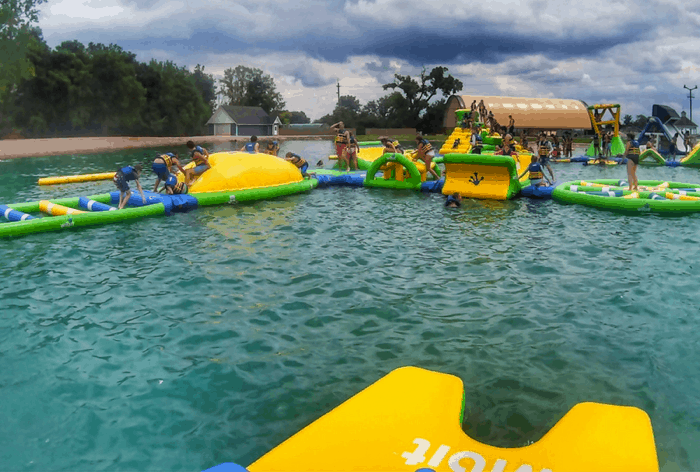 Aqua Adventures at Land of Illusions is located at 8762 Thomas Rd. Middletown, Ohio. You can find out more information on the Land of Illusions website. Thanks again to Land of Illusion Aqua Adventures for hosting our visit. This post contains an affiliate link.